Caulking guns are not the most technically advanced mechanical tools a person may use but can still present problems. 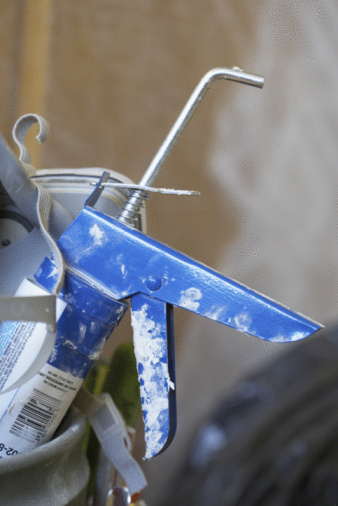 Most consumers opt for the less expensive models when they purchase a caulking gun, but the extra savings may not be worth the time and effort of trying to repair one that gets fouled up. In some instances, it is better to purchase a replacement; other times, its only a matter of troubleshooting. Caulking guns can jam or break. Inspect the caulk tube. Poke the metal prong on the front of the caulking gun into the caulk tube, if your gun has one. Use a screwdriver or similar impelement if your gun doesn't have a prong. Remove it to see if any caulk is present. Often, the tip of the caulk at the front of the gun will harden in place and once it's removed, the caulk will flow normally. If no caulk is present when you remove the prong or screwdriver, however, the tube is empty or the caulk inside is dried and unusable. Reinstall a new tube of caulk. Test the trigger and plunger. Remove the caulk tube and try to manipulate the plunger by depressing the trigger. If it does not move, reset it by pulling the plunger release bar back and try again. Clean the caulking gun. If there is a caulk buildup on the gun around the trigger, plunger, or plunger release, soak the gun in mineral spirits or wipe it down with a rag soaked in mineral spirits. Allow it to dry and test again. Test the plunger spring for tautness. Caulking gun plungers are manipulated by a spring. If the spring becomes loose or strained, it will no longer push the plunger with sufficient force. Unfortunately, if the spring is the problem, it cannot be replaced or repaired and the gun must be replaced.